The cut locus appears in various fields of Mathematics as a set of singular points of the distance function or the exponential map on a manifold. It should be emphasized that the cut locus has been actively studied in both fields of Analysis, (in particular, in the fields of Optimal Transport and Optimal Control), and Global Differential Geometry, since H. Poincaré introduced this notion for a point of an analytic surface in 1905. Since the notion has been, however, investigated almost independently by each other, it will be a good opportunity for researchers from both fields to exchange ideas by joining this conference. Therefore, this conference is open to all researchers who are interested in the cut locus. 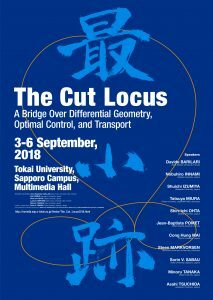 This conference is the continuation of “The Cut Locus 2016” held in Thailand. This conference is partially supported by INRIA.